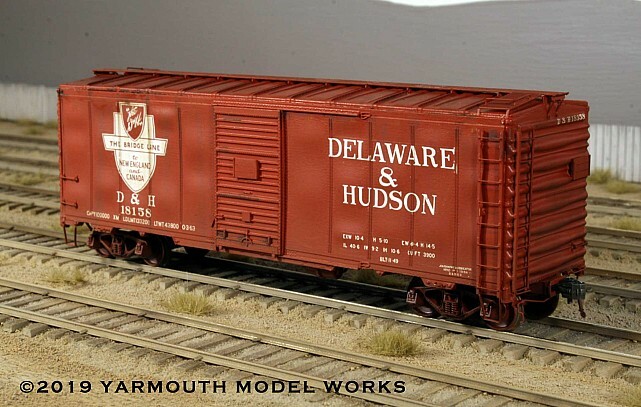 These unique looking cars were built in the D&H's own shops in 1949. Featuring all-welded construction with double-welded, "flat side ribs", 3/4 Improved Dreadnaught ends with added square top rib, Murphy diagonal-panel roof, 10'-6" inside height. Of the 300 cars in this series, the first 200 were equipped with Youngstown doors, and the last 100 with seven-panel Superior doors. The kit features 3D printed masters, one piece resin body, etched details, custom decals from Speedwitch Media and Tahoe Model Works trucks.